Thanks for volunteering at the Manitoba Robot Games! Below you’ll find a list of duties for the announcer while volunteering. The announcer has an important task in keeping the games moving as smoothly as possible in addition to keeping the audience engaged with what’s happening in the ring. There will generally be a good number of students from the Manitoba School for the Deaf in attendance; it’s important that you keep an interpreter with you at all times to ensure that the those attending who are hearing impaired are also able to understand the announcements. The announcer should work closely with the head judge and registration desk to ensure that competitors are getting to the registration desk and competition area as required. Keep an eye on what events are currently being registered for and call any competitors that have not yet registered. The competition area tends to attract a large number of people who want to watch the competitions. Periodically remind them that if they are not currently competing, that they should observe from the bleachers. Also, if you must be next to the rope barrier, please sit such that the people in the bleacher can see the competitions, this will help everyone in attendance to see the competitions. the location of the canteen. These robots have all been built by school age children ranging from grade 4, a few younger, to grade 12. 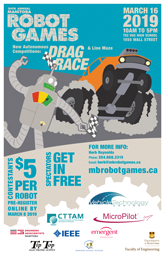 The Manitoba Robot Games is unique in that its games are geared for school age children. Most of the other Games in North America are for post-secondary entrants only. Some people think these are merely interesting toys, not truly robots. But you can’t build a house without first learning to hammer in a nail. Nor can you build a robot to explore Mars or to do any other job without first being able to build a RoboCrtitter, then a Sumo, then a Line Follower. The robot on Mars is a tethered robot, though it is remote controlled. It is considered tethered because it is controlled from Earth. However it also has some autonomous functions. It is a hybrid of the types of robots you see here, though far more complex and more durable. Definitely way more expensive to build! Mini sumo and robo critters kits are available for purchase at the RoboCritter playing area. We also sell t-shirts in all sorts of great colours. For students up to and including grade 6, mostly grades 5 & 6 and is a timed competition which measures controlling & designing skill. The robot is usually built of foam core board, has 2 motors, 2 wheels and a controller. The shape is only limited by the imagination (and some are very imaginative). The robots must hit 10 targets scattered about the playing field. When a hit is correctly made, the target’s light changes from green to red. Drivers get 3 tries & the best time is recorded. Each competitor in this event is acknowledged from the podium & receives a certificate. Spectators who wish to enter but who have no robots can use our demonstration robots to try the course. The cost to enter is $5. Two robots try to push the other out of the ring within a 3 minute round. Any part of a robot touching the floor counts as a loss. Best out of three matches wins. This is a match of design plus driving ability. These robots are scratch built. There are no kits for these. Two robots try to push the other out of the ring within a 3 minute round. Any part of a robot touching the floor counts as a loss. Best out of three matches wins. This is a match of design plus driving ability. These robots can be kit built or scratch built. Robots from kits need to be modified to have a chance at winning since they are too light. This event uses the same principals as its full size namesake but these tractors are much smaller. The object is to pull the weighted sled down a 24 ft track in less than 2 minutes. As the sled advances the weight moves forward, increasing the friction. After a robot has completed its run, more weight is added to the sled. The winner is the one which pulls the most weight to the required point. Record – 12-pound tractor pulled 109 pounds! This is a programmed robot designed to follow a line on each of 4 progressively harder fields. The line is black, 3/4 inch wide on a white surface. Curves, corners, zigzags, a crossover, & slopes add interest & difficulty. Points are awarded for each difficulty passed. Highest total wins. Design, the type of sensors chosen & the location of these sensors plus the programming are all factors leading to how well a robot does. This is the most complex robot in our Games. Robots must accept a load (a 1″ steel ball bearing) & carry it across some very uneven terrain without losing it The obstacles are similar to the ones affecting tanks – “stumps”, “logs”, a lake of marbles, an uneven “hill”, a sand trap, etc. After an electronic start the 2 robots compete at the same time, but in opposite directions. First one to push the bar at the end, lighting the light, is the winner. Two robots try to push the other out of the ring within a 3 minute round. Any part of a robot touching the floor counts as a loss. Best out of three matches wins. This is a match of design plus driving ability. These robots contain sensors and on board programming to hunt, push, or avoid their opponent. The robot can sense the white edge of the playing field so it knows where the edge is. Robots must have a 5 second delay after being turned on before they start moving. Please visit our sponsors displays (indicate their locations). We thank our sponsors for making this event possible. (listed on poster) Particularly, when a sponsored event is running.